ARCO Construction Company Inc. was founded in 1992 in St. Louis, Missouri and has continued to grow by providing clients with a turnkey design and construction solution. The ARCO family of companies consists of nine construction companies with offices in Chicago, Atlanta, Cincinnati, Dallas, Indianapolis, Kansas City, Philadelphia, St. Louis, and Tampa. The Chicago office opened in 2003 as a division of the Murray Company to service the Chicagoland area and national accounts across the country. In 2006, ARCO/Murray National Construction Company, Inc. was incorporated. Today, ARCO/Murray is comprised of three operational divisions: Build-to-Suit/National Accounts, Process, and Interiors; each serving a variety of industry types. 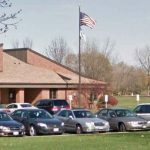 In 2014, after nearly a decade of being based in Oakbrook Terrace, ARCO/Murray relocated to a brand new office building in Downers Grove, IL. ARCO/Murray’s new headquarters is a larger facility with a more modern design and increased solar exposure. The facility receives little-to-no solar blockage from surrounding low-rise office buildings and businesses, meaning the facility is exposed from all directions throughout the daylight hours. ARCO/Murray needed a solar control solution that would preserve their terrific view of the Downers Grove area while providing acceptable levels of natural light and solar heat gain, provide privacy, and match the contemporary style of the building interior. – All clutch operated roller shades utilized a Rollease R-16 clutch and #10 stainless steel bead chain. – All woven mesh shades were made with Mermet E-Screen E7505 White/Pearl #0207 with a 5% openness factor. – All fascia used is 3″ anodized aluminum. Illinois Window Shade Company designed and produced a total of 131 IWS Clutch Operated Shade Systems that are easily-operated and control solar glare and heat gain. To reduce the facility’s dependence on artificial light and create a comfortable work environment for staff, the shades were equipped with woven mesh, transparent fabric that is specifically designed to allow high levels of natural light while reflecting a large amount of solar heat gain. The fabric also provides an acceptable amount of view through to the building’s exterior. 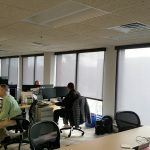 To address ARCO/Murray’s privacy challenges, clutch operated roller shades were again fitted with transparent fabric and placed in the interior windows of the conference and board rooms. The Mermet fabric maintained the modern and minimalist design of the office and also provided sufficient privacy levels for important business meetings and conferences. Rollease R Series clutches were used for both the solar and privacy shades to accommodate the large glass windows of the building. The clutch is ideal for handling large weights and commercial applications and are operated with a #10 stainless steel beaded chain. IWS expertly and seamlessly concealed all clutches and rollers with 3“ anodized aluminum fascia. The Illinois Window Shade Company clutch roller shade systems at ARCO/Murray’s new office space not only look attractive but are also perfectly suited for the building’s geographic location. Staff at ARCO/Murray now have practical means to control the solar light and heat in their office space while conducting exclusive conferences and meetings without visual disruption.